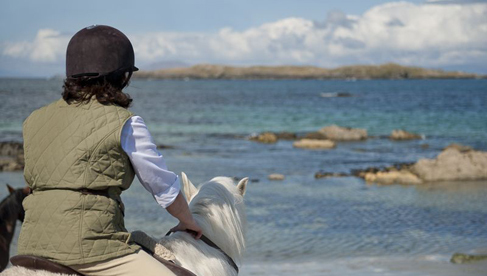 Connemara Equestrian Escapes offers Irish riding vacations in Connemara, a beautiful and pristine area on the west coast of Ireland, and along the Wild Atlantic Way, Ireland's first long-distance touring route, stretching along the dramatic Atlantic Coast. Imagine a luxury equestrian holiday combining horseback riding on beaches, mountains, rivers and lakes that is actually affordable. 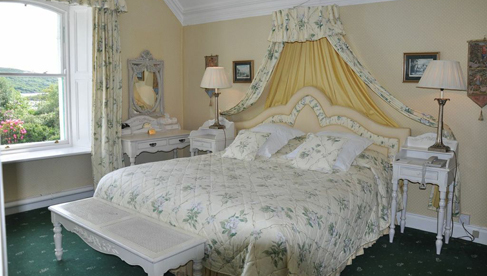 Nights are spent in luxurious castle hotels, manor houses, historic country house hotels and our own farm house with delicious food and comfortable bedrooms. 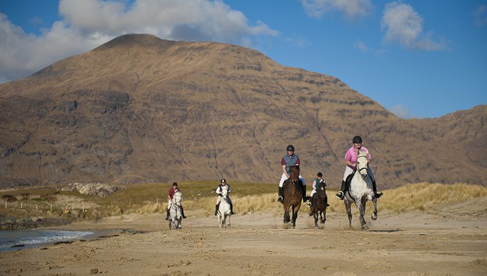 Bring your own horse or ride one of Connemara Equestrian Escapes' "well-trained mounts. Picture this. You are looking out through the ears of a sure-footed Connemara Pony or majestic Irish Draught Horse. You can feel the soft, West of Ireland breeze on your face. The only sound is the Atlantic Ocean gently lapping the shoreline. The aroma of a distant turf fire mixes with the scent of the sea. You can still taste the gourmet breakfast you enjoyed after a restful sleep in luxury accommodations. A new day of freedom, exploration and discovery stretches before you. 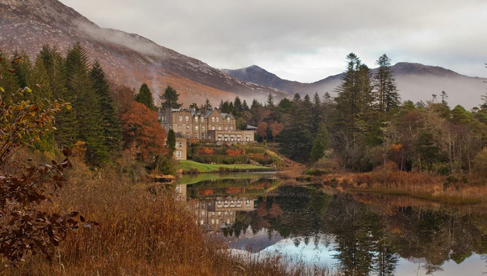 You are experiencing the magic and mystery of Connemara and the Wild Atlantic Way in a unique and memorable way. This is so much more fun than any other horse riding vacation. 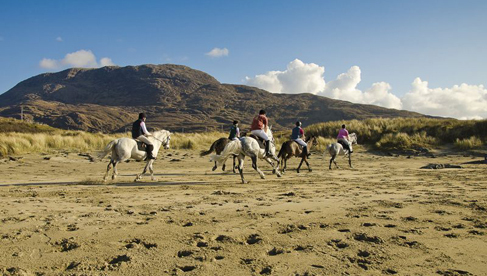 Connemara Equestrian Escapes provides horseback riding vacations with different lengths of stay - 3 day/2 nights to 7 day/6 nights. Each package includes activities on horseback as well as the opportunity to experience the unique culture and traditions of the area. Every day you will be introduced to a new aspect of the heritage, history, culture and traditions of the magical and mythical place. 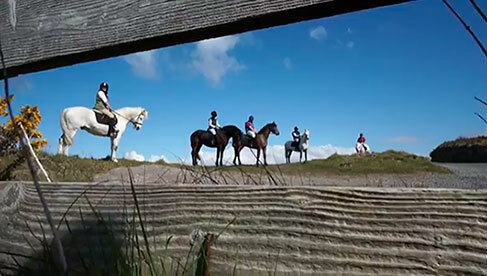 During their down time, horses and riders from Connemara Equestrian Escapes vacations compete at nationwide equestrian events such as amateur show jumping, cross country and dressage competitions, purely for fun. 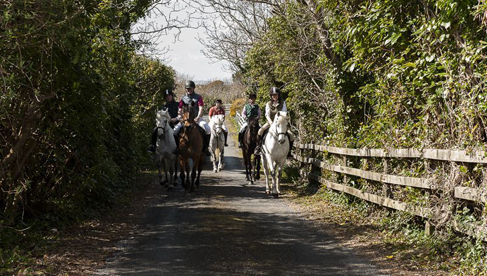 Connemara Equestrian's equines are kind, forward going, responsive but most importantly, they are true and loyal friends. 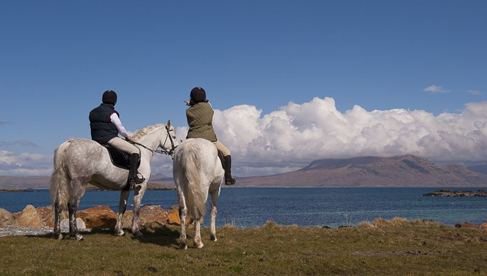 Safety of both rider and horse is paramount at Connemara Equestrian Escapes and staff are continually educated through the BHS (British Horse Society) Equestrian Tourism Programme. 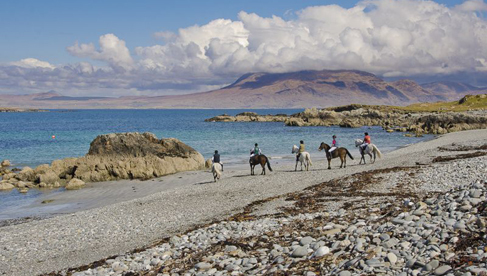 Are you ready to pack your suitcase and come and join us along the Wild Atlantic Way in Connemara, Ireland for the equestrian vacation of a lifetime? Due to a cancellation, we have limited spaces left on the May 13th- 19th 7 day trip. 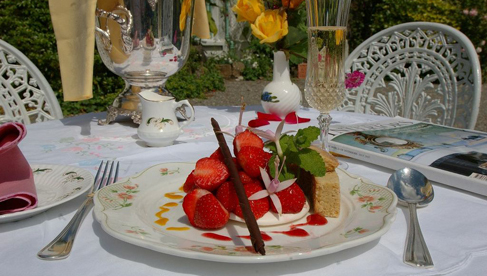 Price includes transfer to and from Galway City, three nights accommodation at Curra Farm, three nights at Renvyle House Hotel & Resort, daily trail riding on our wonderful over-height Connemara Ponies, daily cultural activities, beautiful food from award winning chefs, all internal transfers. Just bring your riding boots! * Price in based in Euros, so USD price subject to currency fluctuations. Learn more! Email Cait. Call +353876445589. 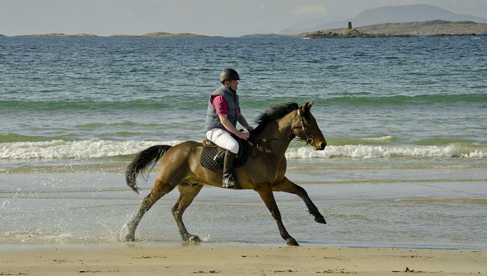 Visit Connemara Equestrian Escapes website. 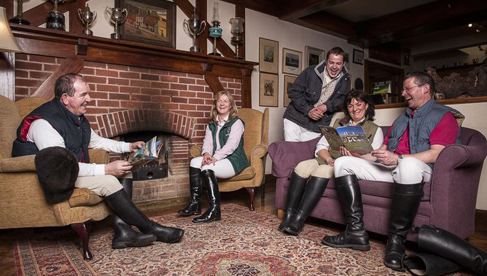 4-star country manor hotels, a castle and our own farmhouse, offering comfort, fine dining and superb countryside views. 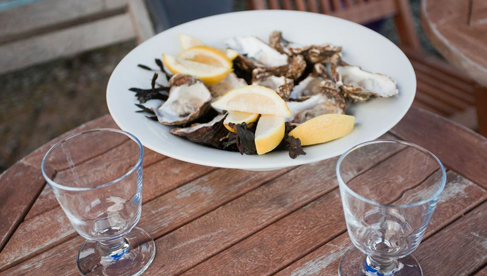 Fresh, locally sourced, meat fish and seafood, home-grown salads and vegetables, (organic where possible) homemade breads, cakes and desserts. Food is gourmet, plentiful and tasty. 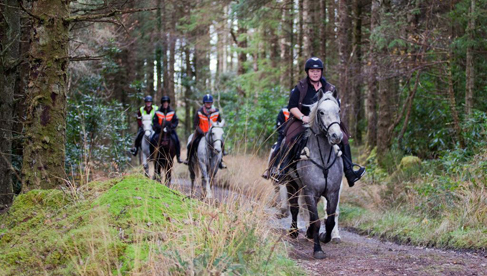 Horse riding on country lanes, bog roads, forestry tracks and sandy beaches. 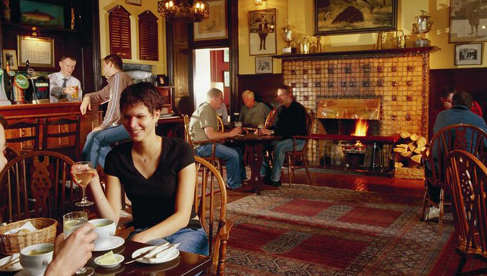 Cultural activities include boat trips, visits to significant historic sites, sheep shearing or fish smoking demonstrations, a traditional Irish music 'session', Gaelic games and turf cutting. 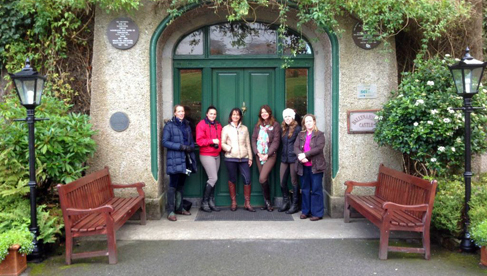 Bring your own horse or ride one of Connemara Equestrian Escapes' horses. 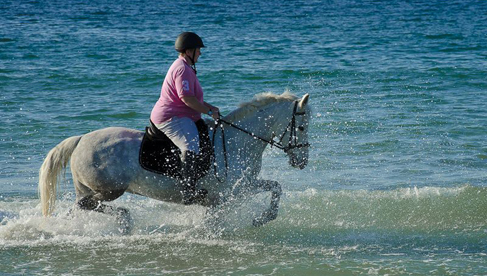 There is plenty for equestrians and their non-riding companions to do on these vacations. Please ask us about activities for non-riders, including fishing, golf, tennis, biking, hiking and sightseeing. Non-riders can choose to join the riders for lunch and cultural activities each day and rates can be negotiated to reflect this. 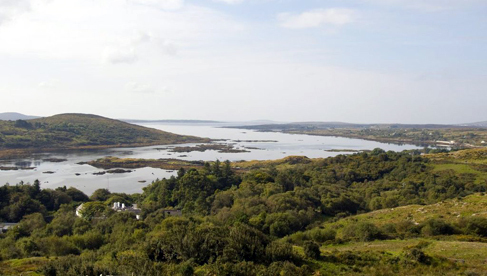 Connemara is an area of outstanding natural beauty, unchanged for centuries. The pace of life is slow and easy and visitors are assured of a warm welcome. Every stone has a story to tell. 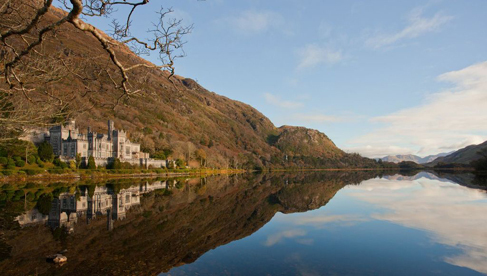 The entire history of Ireland is reflected in Connemara and some world-changing events happened right here. All methods-- cash, check, credit card-- accepted.